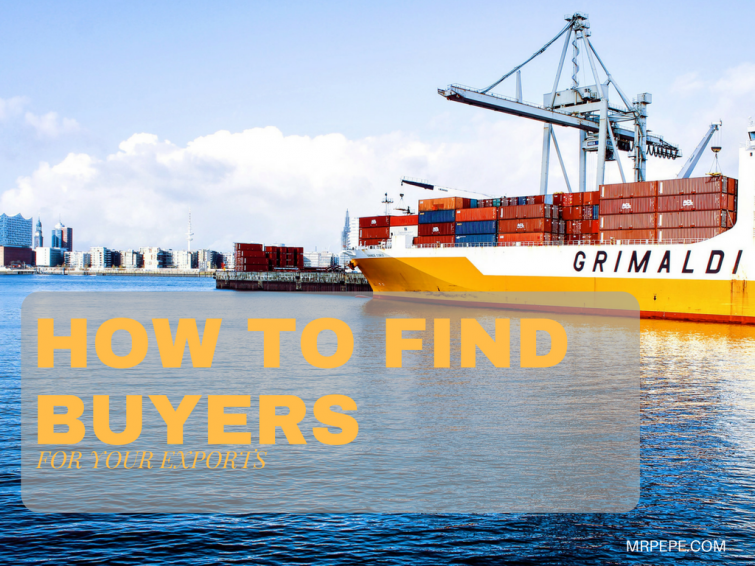 Finding international buyers for your exports can be a unique challenge. In this article, you will learn how to utilise your available resources to conveniently connect with prospective trade partners abroad. The most important thing you can do is to have a web presence: a website. Interested buyers looking on the internet should be able to find you when they search for the product you specialise in sourcing. When you attend trade expos, you have the opportunity to showcase your products and services, meet with potential buyers and connect with trade partners. Trade events have attendees from different regions who provide exporters with a large number of business leads under a single roof. The Lagos Chamber of Commerce and Industry (LCCI) usually organises trade Expos which is well-attended by multinationals and foreign traders. The LCCI ultra-modern Exhibition and Conference Centre is located at Plot 10, Bola Ahmed Tinubu Drive , Central Business District, Alausa, Lagos. The Nigerian-British Chamber of Commerce (NBCC) is a foremost channel of trade between Nigeria and Britain which encourages and promotes trade between these countries. Among the NBCC’s objectives is to provide information and market intelligence service on United Kingdom/Nigerian trade in the form of regular trade bulletin. They also organise Trade Missions. A trade mission is an international trip organised for the purpose of exploring international business opportunities. It is an effective way to seek out potential trade partners. For this reason, if you’re looking to export to Britain, NBCC should be your first point of call. You need to have a registered company to join, and membership costs N170,000 for companies with less than N500m in turnover. To register, you will need to fill out the membership application form on this page and then submit in person to the secretariat at Olubunmi Owa Street, Off Admiralty Way, Opposite CBC Towers, Lekki Phase 1. Various internet websites allow you to post your products or services online, so that prospective buyers can come to you, instead of you searching for them. These are called ‘online marketplaces’. The way these online marketplaces work is that you as a seller posts information about your products online, making your services available to anyone in the world who needs them. When interested buyers search for your services in these marketplaces, they can see your products and get in touch with you to make enquiries. Sites like Alibaba and Tradekey are examples of such marketplaces. One important thing to note when offering your services in online marketplaces is that just like meeting strangers in real life, you must deal with contacts you meet cautiously. Always verify their full address by using Google. You can also query their company name and website using scamadviser.com to check how long they have been in business, as well as the level of trust they enjoy. This is a powerful but underutilised tool for finding foreign trade partners. Companies and their employees from all over the world advertise their services on the website. The two most effective ways you can use this platform for prospecting potential buyers are by using the filtered search option and joining relevant groups for your industry. There are many groups for all types of industries on LinkedIn, so it is best to be specific from the beginning as to what region and industry you’d like to find a group for. You will need to find the most active groups and join them to begin engaging with other professionals to build up your network. Have you identified the competitors who are already selling in your target market? Try to find look at companies which carry similar products as you, and learn from them how they engage their customers. This would enable you to understand your target market better. By this method, you should be able to find a similar business(es) in the same country that will be ready to do business with you. If you can’t find any competitor already operating in your target market, search for local products in that country that are similar to yours. If you have a product that is higher quality, differentiated, etc. you can often find distribution in the same retailers as the local manufacturers. Be sure to place emphasis on what makes your product unique for the best chance of success with this tactic. Using business intelligence search tools such as ImportGenius is another way you can find buyers for your exports and connect with them. ImportGenuis has a large export-import database, and helps you find what businesses imported to the USA, and also the businesses which received these imports. The site is populated from the US customs database, and the cheapest plan is at $99 per month. Alternatively, you can use a free tool called PortExaminer, but without the depth of information that ImportGenius provides. At this stage, these trade data tools are magic wands you can use to gather as much of information as you can– from transportation of goods to buyers and sellers of a particular product; and trading prices to the shipping lines, ports, and trade lanes employed for the purpose of international trade. These trading companies are government-controlled foreign companies that are involved in the import of a particular product relevant to your area of export should another focus. Most of these agencies already have buying agents in countries where they are looking to import from.They go about outsourcing these through agents. You can contact these buying agents in Nigeria and let them know of your products. Some of the private consultants can be buying agents for other countries in Nigeria since they know more of the markets than the companies abroad do. Getting in touch with these agents can help you to expand your market base tremendously. Google and Facebook ads are good ways to advertise your products. You can place online ads to reach your target audience, as a means to get quality leads for your products online. Once you get these prospects, be sure to put things in place where your prospects can contact you – if possible get their email addresses for follow-up. For a monthly subscription fee, these marketplace portals send targeted buyers to your online store which helps you get more buyers to do business with. Letter of Credit: This is a document which a buyer obtains from a bank in his/her country. This letter is issued to you the seller, and it acts as an obligation of the bank guaranteeing the buyer’s payment. It is recommended that you confirm a letter of credit by your own bank here in Nigeria. With this method, you will use the services of a bank to effect payment. Once you are satisfied, you can then you will ship the goods along with the bill of lading and a draft. A Bill of Lading (abbreviated B/L) is like a ticket which outlines the journey of your cargo from origin to its destination. It functions as a contract for the movement of the goods, with the fine print – the terms of the contract – frequently outlined on the back of the bill. It also serves as a receipt for the cargo and can act as proof of ownership of the goods being transported. The draft is a cheque-like document that will be forwarded to your bank. Your bank will forward the documents to the buyer’s bank and the foreign bank will collect payment from the buyer before the arrival of the goods. If payment is not made by the buyer, the correspondent bank will not release the bill of lading to the buyer, and the buyer will be unable to take possession of the goods or clear customs. Finally, getting genuine foreign buyers for your products can be a straightforward task if you follow the steps as explained. We cannot generalise about it being difficult or simple. It depends on the situation and the motivation, and the level of enthusiasm you have for success as an exporter. How are people paying for dollar-denominated goods these days? to connect with millions of foreign products buyers from the country of your choice. I have use this company to engage with many buyers in different countries for my bitter kola export business. Their service is reliable. If you are into export business , There are so many company website this days like http://www.smsglobal4.com that will enable you as an exporter to build millions of foreign buyers for your export products from the country of your choice through the power of bulk sms. This company have a great customers building list service for the marketers. I have used this company to engage with so many foreign buyers in my cocoa beans export business in different countries through their buyers and consumers platform directory. I really appreciate your advice in the write up.I am dealing with palm oil here in Nigeria. And I want to start exporting it to other countries, but I don’t know how to get buyer for my products. There are thousands of buyers looking for palmoil all over the world. The difficulty in getting access to them lies in communication. To be successful, you need to understand first their language, and second, their needs. If you cannot study these buyer requests and all the terms and understand and fulfill them, you’re halfway there. Our organisation has just been registered as Exporter of Agricultural products (eg) Palm Products,Yam, Cassava,Cocoa,Rubber,Cashew, Groundnut,Wood, Galic,Ginger,etc but we are still searching for buyers of our Products from nations of the World. I precisely had to say thanks again. I do not know what I could possibly have done in the absence of the type of suggestions shown by you directly on such a concern. Entirely was a real horrifying situation in my position, however , being able to see a new well-written mode you treated that made me to weep for fulfillment. I will be happier for this guidance and thus pray you know what a great job you’re undertaking teaching some other people thru your web page. I know that you have never met all of us.